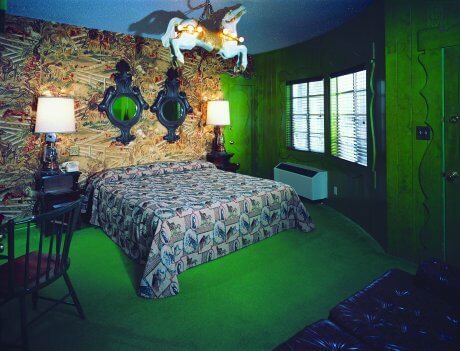 In my initial post about the Madonna Inn – the iconic 50s motel in St. Luis Obispo, Calif. – I showed five viva Las Vegas rooms. Today – some simply wonderful, kitschy rooms that throw in waterwheels, Flintstones fever, and lots of horsing around. Above is the “Old Mill Room” – I love its coral, chartreuse and teal mashup of color, not to mention the hot pink miniature mills. Now who thought of that? Let’s always remember to: Not take ourselves too seriously with this decorating stuff… Click through for six more great vintage style bedrooms. 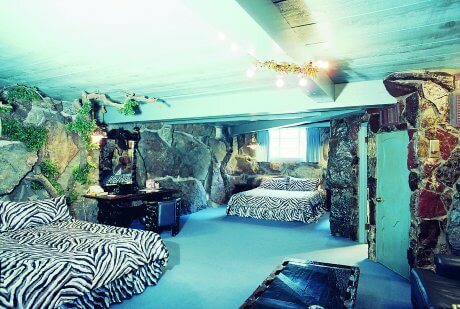 I think that Fred and Wilma Flintstone go in “The Caveman Room” (above). It matches Wilma’s hair. Barney and Betty go in “The Jungle Rock Room” (above.) Zebra stripes look good against aqua, don’t you think? The “Country Living Room” above is not a wild and crazy room at all – and it looks like you could live in this space and never leave it. I love the copper hood over the fireplace. 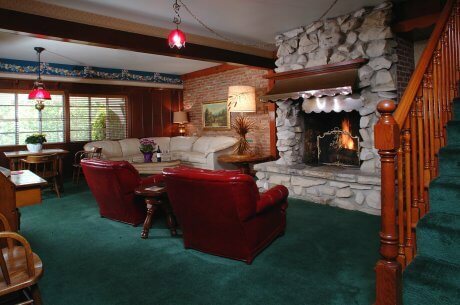 Notice the light fixtures in the “Pony Room” above: A round disco-y ball at the far left, a mini wagon-wheel (?) hanging in the ceiling, and two colonial lantern sconces flanking the bed in the foreground. Not sure about sleeping under a pony here in “The Chestnut Foal Room,” our last eye candy for today. I think that qualifies as bad feng shui….but these folks definitely always get points for decorative imagination. Love the scalloped/painted trim around the front door (far right). Thanks to Susie and Peggy at the Madonna Inn for their help with this post and more inspiring bedroom images still to come. 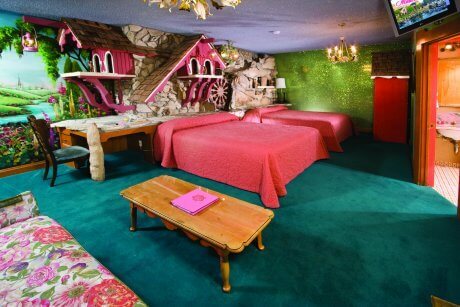 Here’s the link to the Madonna Inn – be sure to visit if you’re in the area! Fun to see my town featured on your blog. Yep, the Madonna Inn is a landmark! If your readers are in San Luis Obispo (SLO) tell them to stop by Baileyana Winery (www.baileyana.com), located in the historic Independence Schoolhouse built in 1909. Sorry, shameless plug on my part, I’m the wineclub coordinator there. Love your blog! I sure hope the “chestnut foal” is well attached…I’d hate to be sleeping under him during an earthquake! We’ve been to SLO a gazillion times but have never made it to the Madonna. 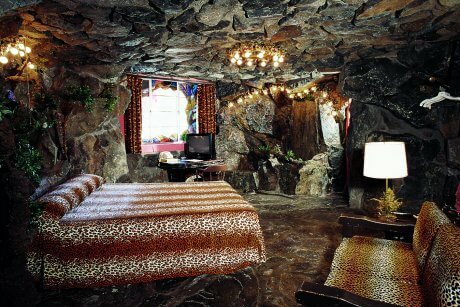 My friends stayed in the Caveman Room on their honeymoon and said it was unforgettable for sure!